The challenge for Global Mamas is how to keep up with our success. We currently have significantly more demand for our products than we can produce, resulting in regular backorders. Our customers are supportive and loyal, but they are also pushing us to expand quickly, so we can ship their orders in full. The Mamas are facing orders that are too large to complete in the required time frame. The Ghanaian and American staff of Global Mamas are stressed trying to manage the production of significantly larger orders through a business model that worked well in the early years but is now very strained with growth. When Global Mamas started working with recycled glass bead makers in 2005, we used a hybrid producer/employer model, contracting family-owned businesses to produce the beads, while directly employing local women to assemble the beads into finished jewelry and home décor items. This new model improved product quality, lowered costs due to rejects, helped ensure fair wages to producers, and expanded production capacity to meet the growing demand for Global Mamas products. In 2011, we made the decision to test the success of our direct employment model with a group of new batikers and seamstresses. We targeted a community that had trained batikers and seamstresses, but due to its extremely depressed economy, the women were struggling to keep their own small businesses afloat. The model worked! The small textile center in Ashaiman now employs twenty-five women and is poised to double that number in 2014. Direct employment allows us to provide benefits, like paid sick leave and vacation, as well as twelve weeks of paid maternity leave. On top of that, Global Mamas pays an additional 13% of total salaries to social security, ensuring that the women have access to retirement funds and free national healthcare, to which only 8% of workers in the craft industry in Ghana currently have access . The Mamas of Ashaiman are empowered to make decisions that guide the organization, such as setting the hours of operation to allow them to see their children off to school each day, and setting the break schedule that is most convenient for them. Global Mamas believes that none of our income-generation models can be successful without a major focus on education, and we’ve modified our training programs to expand beyond business training to include topics like personal financial management. This is especially important, given that 85% of the Mamas have not studied beyond high school. In 2013, after carefully weighing the benefits of both of our production models, Global Mamas made the decision to begin raising funds to build a production campus called the “Global Mamas Fair Trade Zone.” The Fair Trade Zone will allow Global Mamas to create 200 full-time jobs and increase production output by nearly 50% by operating in a central facility. The Fair Trade Zone will utilize our direct employment model which has proven to increase production capacity, improve quality, reduce rejects, provide the Mamas with more access to training, and allow a greater percentage of sales to be directed to wages and benefits, as compared to working with many independent micro- and small businesses. Two hundred women working together in a single location sounds a lot like a factory, yet it is extremely important to us that it does not feel like a factory. Building on successful local models that the producers can identify with, the Mamas work in teams of three, much like a small business, and create their own team name. Each team has an experienced leader who provides on-the-job training to the less-experienced Mamas. This model sets the stage for sustainable growth — as a Mama gains expertise in production, she can “graduate” to start her own team. We also partnered with Architecture Sans Frontières to design the Fair Trade Zone to be an open, comfortable production space filled with natural light. 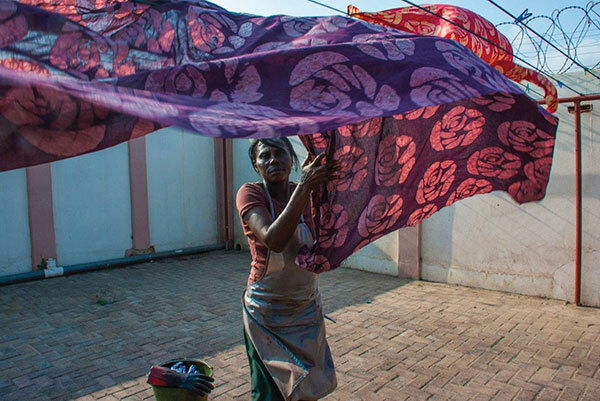 Landscaping will create outdoor spaces for batik production and fabric drying, as well as for the Mamas to gather, eat and rejuvenate during the workday. An on-site daycare center is included in the plans to enable mothers to work while not being far from their children. Given our commitment to long-term environmental sustainability, Global Mamas plans to build the facility with local, sustainable construction materials like compressed earth blocks, bamboo, and recycled plastic, glass and tires. It will incorporate renewable systems, such as rainwater harvesting, water recycling, solar energy and biogas toilets. Building our own facility allows us to incorporate these unique features which our current rented facilities do not offer. Global Mamas is setting out to prove that we can grow, provide fair trade jobs for hundreds of new women, and maintain empowerment of the Mamas within a larger organizational structure. At the same time, Global Mamas is committed to working with all of the Mamas in our original textile production center in Cape Coast, utilizing our traditional model of working with small, independently-owned businesses. 1 The Labour Market in Ghana, p. 24, SASK, December 2009.